If cricket fans and experts are asked to compile a list of the top 50 individual performances in Test cricket from 1966 onwards to the present day, one would expect the names and performances of Viv Richards, Gary Sobers, and Brian Lara to figure on that list, and so would Shane Warne and Muttiah Muralidaran. The names are deserving enough to make this, or any, list of individual brilliance compiled by any cricket lover or expert around the world. It’s unlikely, though, that Dean Jones’ 210 vs India played in the Tied Test in Madras (1986) would make it to that list. Batting under the scorching Chennai sun, Jones vomited multiple times besides the pitch, urinated in his flannels, and ended up in a hospital on a saline drip by the time his 8-hour marathon ended. What would make it to the list, at the expense of the classic mentioned above, would be Sanath Jayasuriya’s 340 vs India, Brian Lara record breaking 375 & 400 vs England, and Viv Richards’ 291 vs England. All of these innings were played in dead Tests or dead rubbers whereas the tied Test match heralded a new era in Australian cricket, it began their quest to become the leading Test playing nation in the world. I may not speak for all cricket fans/experts, what I'm putting forth instead is a very simple point: In usual cricket discourse, romanticism and visceral thrills are often preferred over the real substance of the performance (and it may not always be ‘big’, numerically). Navjot Singh Sidhu’s biggest contribution to Indian Cricket, as is often said, was when his illness allowed Sachin Tendulkar to open the batting for India in an ODI vs New Zealand in 1994. Tendulkar smacked 82 from 49 balls and claimed that spot till the day he retired 18 years later. A batsman who was arguably one of the biggest match winners of his day (as the analysis would bring out), for his legacy to be reduced to being a pedestal for his more storied batting partner’s climb to immortality is indeed a shame. My father, Ajay Bhanot, once bowled to him during the Ranji Trophy trials in Patiala in 1981, he remembers Sidhu as a batsman who was solid in defence, but lacked strokes. Dubbed as a strokeless wonder after his international debut in 1983, Sidhu returned in the 1987 world cup as an attacking opening bat and with a special relish for Spinners. From then on, he never looked back. Sidhu was at his peak as a batsman between 11 Feb 1993 and 25 Mar 1998, during which he averaged an astonishing 59.56, and only Tendulkar (64.13) and Steve Waugh (61.10) averaged more than him. Curiously, out of the 8 batsmen who averaged more than 50 in this period, 4 are Indians. Sidhu was also, by a distance, the best opening batsmen in this period, averaging almost 10 points more than the next placed Sanath Jayasuriya. 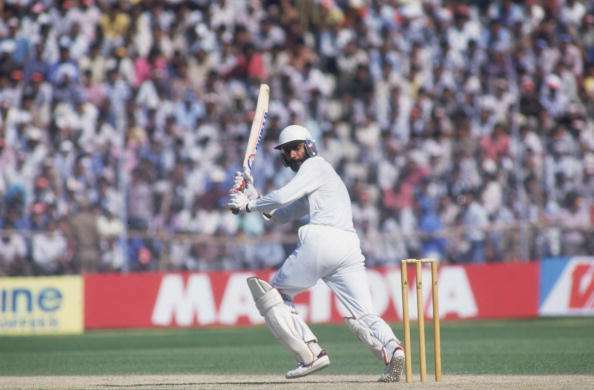 His most notable innings during this period include his six studded 124 vs Sri Lanka at Lucknow (1994) where he took Muralidaran to the cleaners, the 11 hour marathon 201 vs West Indies at POS (1997), and four consecutive fifties in the 1998 Border-Gavaskar series, where he and Tendulkar took Warne and Australia apart with their attacking stroke play. Some of Sidhu’s bravest innings came in the period that preceded his peak as a batsman. In the 1989 Sialkot Test vs Pakistan (Yes, the one where Waqar hit Sachin on the jaw), India had nearly given away their 74-run first innings lead tottering at 4-38. Sidhu’s 97 was not only the top score of the match but was also instrumental in India averting a defeat and hence for the first time ever, a series was drawn in Pakistan. Also worth a mention is his 116 vs West Indies at Kingston, 1989 against the pace battery of Marshall, Ambrose, Walsh and Patterson in a match where no Indian batsman scored more than 47. A lost cause eventually, but a gutsy performance. Sidhu, throughout his career, was a match winner second to none. For batsmen who scored more than 1000 runs in team wins during his career span, Sidhu’s average is next only to Steve Waugh, Graham Gooch, Shoaib Mohammad and Jimmy Adams. He is also the only Indian batsman apart from Sachin Tendulkar to average more than 60 in wins. Sidhu toured England and Australia only once in his career and fared badly in each of them. But what must be noted is that he made those tours in 1990 and 1992 respectively, which was a period when he had not yet found the batsman in him. He declined to tour England in 1996 owing to differences with Mohammad Azharuddin, who knows what numbers he would have gathered had he opted to go. When India-WI ODI in 1994 got delayed due to lost cricket kits!